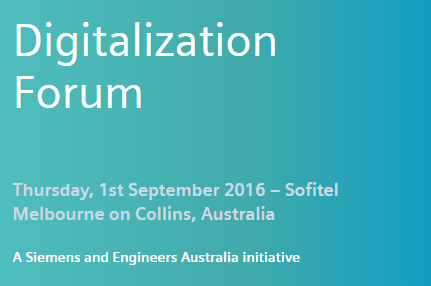 Engineers Australia and Siemens announced their inaugural Digitalization Forum which will be held in Melbourne on 1st September. 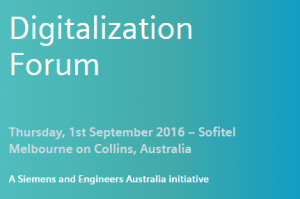 The cross-industry forum will bring together industry leaders for a timely discussion on the impact of digitalisation on energy, automation, building technology, transportation systems and process industries. Visiting Siemens global Member of Managing Board, Dr. Roland Busch will deliver keynote on core industries transitioning to the new economy and on the full potential of digital technologies for competitive advantages. The forum will also feature panel discussion from select members of ‘The Prime Minister’s Industry 4.0 Taskforce’ which was established to support Australia’s transition to a new economy and connect the nation to the fourth industrial revolution. “Germany is at the forefront of digitalization and helping their industries transition to the fourth industrial revolution – Industry 4.0. With operations in 190 countries, Siemens is ideally placed to share knowledge and insights on how companies and industries are embracing digital technologies to reduce costs, improve efficiencies, increase flexibility and productivity – ultimately becoming more competitive,” Mr Connolly said.